Mountain fortress in Peræa, on the boundary between Palestine and Arabia. Alexander Jannæus first built a fortification there (Josephus, "B. J." vii. 6, § 2). His wife Salome Alexandra turned over to the Sadducean party all the citadels with the exception of Hyrcania, Alexandrium, and Machærus (Josephus, "Ant." xiii. 16, § 3), where the Hasmoneans had their treasures. Gabinius advanced upon Machærus; Alexander surrendered, and the fortification was razed to the ground by the former ("Ant." xiv. 5, §§ 2, 4). Shortly afterward Aristobulus fortified himself there, and Gabinius captured the position again after a siege of two days ("B. J." i. 8, § 6). Herod restored it as a frontier fort against the Arabs, founded a walled city there, and built towers, turning the whole mountain-top into a fortification. In the middle of the fortified space he built a splendid palace ("B. J." vii. 6, § 2). According to Pliny ("Historia Naturalis," v. 16, § 72), it was, next to Jerusalem, the strongest fortress in Palestine. In the war against the Romans it was occupied by Jews after the Roman garrison had retired from it ("B. J." l.c.). Not till two years after the fall of Jerusalem did Lucilius Bassus advance upon Machærus with a Roman army. The fort was defended by a heroic youth called Eleazar; he fell into the hands of the Romans and was to have been crucified; but the Jews, to save him, surrendered the city on condition that they be allowed a safe retreat. The Romans, however, broke their word; about 1,700 men were killed, and the women and children were sold as slaves; 3,000 Zealots who had joined the fugitives from Machærus were killed in a bloody battle near the Jordan (ib. vii. 6, §§ 1-6). Several wonderful features of Josephus' narrative can be explained through Talmudic accounts. According to Josephus, in the Herodian palace was a rue which grew as high as a fig-tree ("B. J." vii. 6, § 2); with this statement should be compared Yer. Peah. vii. 4 and Ket. 111b (see Winer, "B. R." s.v. "Senf"). Josephus says that from two hills in the vicinity flowed two springs, one warm and the other cold, and that together they afforded an agreeable and healthful bath; allusion is made to these hills in the Talmud also when it declares that the goats in the mountains of Machærus grew fat upon the odors from the Temple (Tamid 30; Yoma 39b), meaning probably odors from the mountain of Machærus itself, which was used as a signal-fire station for the announcement of New Moon (R. H. 23b; Tosef., R. H. ii. 2). 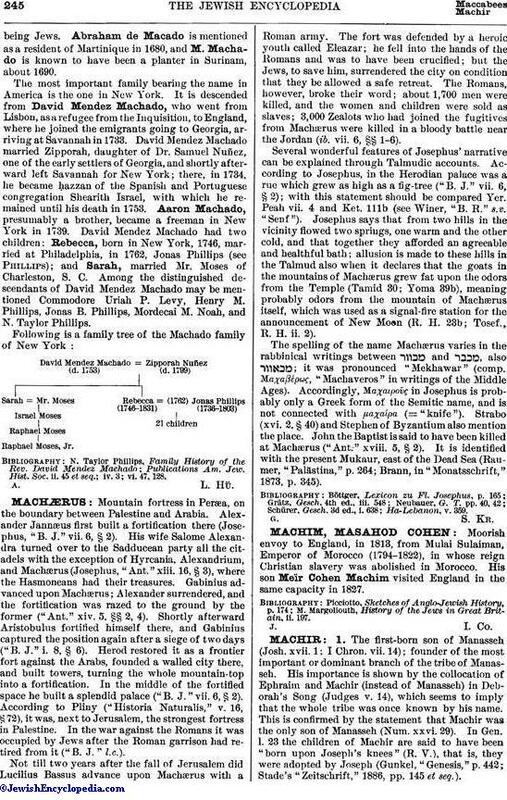 The spelling of the name Machærus varies in the rabbinical writings between and , also ; it was pronounced "Mekhawar" (comp. Μαχαβέρως, " Machaveros" in writings of the Middle Ages). Accordingly, Μαχαιροῦς in Josephus is probably only a Greek form of the Semitic name, and is not connected with μαχαίρα (= "knife"). Strabo (xvi. 2, § 40) and Stephen of Byzantium also mention the place. John the Baptist is said to have been killed at Machærus ("Ant." xviii. 5, § 2). It is identified with the present Mukaur, east of the Dead Sea (Raumer, "Palästina," p. 264; Brann, in "Monatsschrift," 1873, p. 345).